Make your anniversary an unforgettable one, celebrating with champagne and Greek delicacies while taking in the breathtaking sunset and turquoise waters. Whether this is an intimate celebration, between you and your significant other, or you would like to invite along family and friends, Rio Frio can offer its luxury and comfort to mark this wonderful occasion. All you need to do is pick your favourite route and we will take care of the rest. If fishing is your thing, our local Captain can take you to the best hidden spots, where you can fish for hours. Enjoy the calm waters of the Ionian Sea or Amvrakikos Gulf and take in the scenery, while trying mouth-watering local delicacies. Our crew will ensure you have minimum destructions, so you can experience the ultimate piece and serenity that can only be found in the sea. In the evenings, explore the local harbors, restaurants and bars of the islands. Looking for a romantic little extra to your holiday? 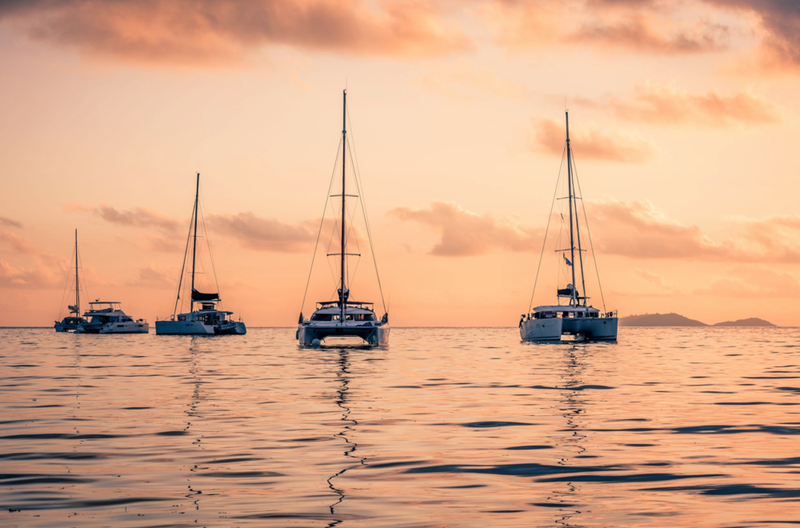 We can take you for a relaxing evening sail around the Ionian, so you can enjoy the famous Greek sunset. Watch the sky turn all shades of orange and pink and take in the magical scenery, while you sip champagne and relax in a luxurious, private setting with your significant other. If you’re looking for something different to do on your bachelor or bachelorette party, hiring a private yacht for the day might just be it. A group of up to 10 of you can enjoy the sunshine, dive in the blue waters of the Ionian and have fun with the floats in the best possible backdrop for countless ‘grams! Party all day in a private, luxurious setting – you’ll be at the expert hands of our qualified Captain and crew, so you can just focus on having a great, carefree time. Dive in the wonderful waters of the Ionian, where you can explore the rich marine life. A diverse ecosystem of flora and fauna includes starfish, crabs, eels, seahorses, octopus, sea anemones and if you’re lucky, you may even encounter dolphins and sea turtles. The crystal clear waters ensure high visibility, so you won’t miss a thing. After you are settled back on the yacht you will be offered herbal tea, which will help you reflect on the magical world you have visited. Would you like to visit the beautiful Greek islands but you don’t want to waste time researching and booking multiple itineraries? Worry not! All you have to do is pick your company and the islands you’d like to see and we’ll take care of the rest. We’ll organize everything and ensure you visit all the top beaches in each island. So all that’s left for you to do is relax and let the magic of Ionian islands captivate you.